There are a surprising number of restaurants that deliver take out in Bethel. This Friday we ordered from one of Bethel’s finest. The Menu declares itself, “The Alternative to Fine Dining……” . 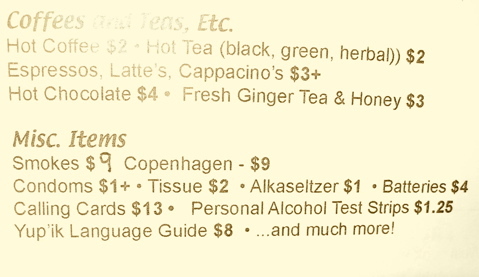 Part of this alternative includes some unique delivery items included on the menu above. No Joke!